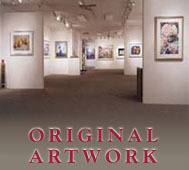 Leslie Levy Fine Art, established in 1977, is one of the Southwest’s leading art galleries. We are proud to represent some of the finest contemporary American realists. Many of our artists have received well deserved recognition by museums and their artwork is included in major collections. We hope you will enjoy browsing our user-friendly website. You may call, e-mail, or write to us with any requests for additional information, photographs of available works, artists biographies, or to be included on our mailing list. If you would like to purchase any of our original artwork on terms, we offer a 90-180 day interest free layaway plan. We ship all over the world and are known for our expert packaging. For original artwork and limited editions, we provide an appraisal or certificate of authenticity.